News & Views | EAA Chapter 527 – KSBA | It's all about flight! Please let Lloyd and/or me know if you can make it. We need pilots and ground crew! There are usually a LOT of kids there so please volunteer if at all possible. I have attached an Airport Day Poster, and the latest “Pilot Registration Form” (click for PDF Form) for distribution (NOTE the requirements). 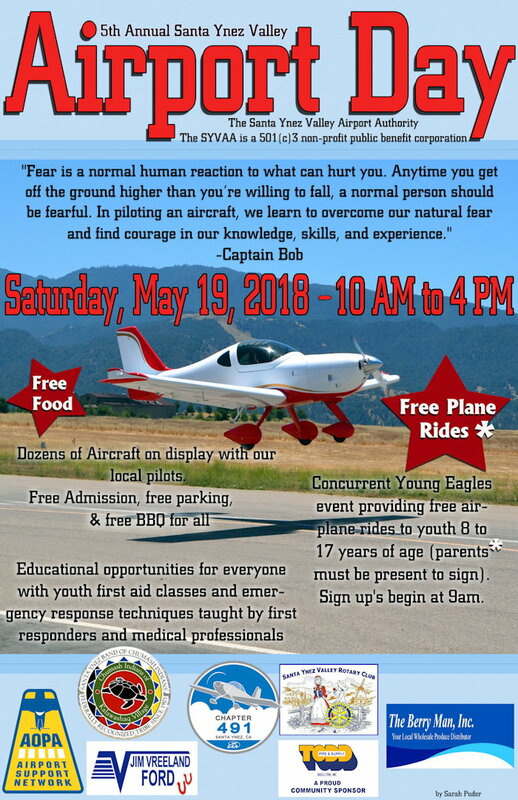 Please spread the word around the KSBA and KIZA pilot communities about the Santa Ynez Airport Day event on Saturday, May 19th, AND the appeal for Young Eagle pilots! Ps; One very generous pilot based at KIZA has donated $500 towards fuel to be distributed among the YE pilots! We thank Chip Fenenga at SYUHS graphic arts and his student Sarah Puder for the outstanding Airport Day 2018 poster. If you want a full size pdf image let me know as it’s 17mb and better delivered by thumbdrive. Please pass around the attached poster on your social media. I sent out a save the date message a month or so ago. Lynn and Ken Orloff host us at their place in Pint Mountain (E45) every Spring. The date this year is Friday, Saturday, Sunday May 4, 5, 6. Arrive Friday afternoon or anytime Saturday and leave Sunday after breakfast. Lynn usually makes a great dinner for us all on Friday night and a wonderful breakfast Saturday morning. There’s always something around for lunch Saturday. Saturday night is the meeting of the Pine Mountain Flyers. It is a pot-luck so everyone needs to bring something. Lynn has microwave and fridge for our use. Once again we have managed to schedule this event for Ken’s talk. Ken is an aircraft accident investigator/reconstructor. His talks are FASCINATING; for pilots and non-pilots. Absolutely GREAT! You do NOT want to miss this. Sunday we all go out for breakfast and then people leave. Land at E45 heading west. Take the last turnoff to the right at the very West end. Turn left and follow the taxiway. Theirs is the first house on the left past the horses. We park on their ramp or follow the “follow me” to their other ramp. Beds, linens, etc. all are provided. I need everyone’s names, plane type, N number. You don’t want to forget to circle Saturday November 3, 2018 on your calendar. 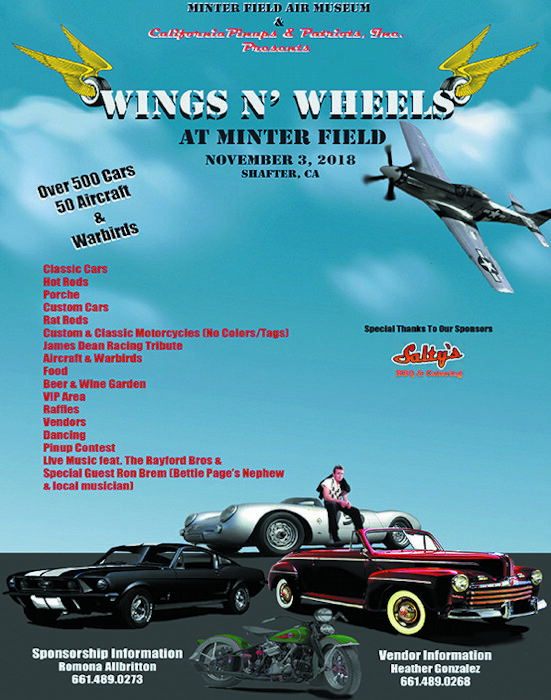 Minter Field Air Museum and California Pinups & Patriots Inc. presents Wings and Wheels, 400 + Cars. Food, Bear & Wine Garden, Live Music, Dancing, Pinup Contest and James Dean Racing Memorabilia. The annual Pine Mountain flyout will be May 4, 5, 6. Ken will be giving one of his wonderful talks Saturday. For now… SAVE THE DATE!!!!!!!!!!! !